Soothes irritated skin, heals shave cuts nicks. This revitalizing serum is an intense blend of pure plantain, sandalwood and peppermint oils, to fortify skin’s anti-aging defenses and boost brightness for a fit, fair, radiant complexion. Skin is perfectly prepared for further treatment. A powerful antiseptic with aromatics herbs from the Far East. Contains Sandal Wood Oil and Peppermint Oil. Protects and soothes irritated skin. Heals minor cuts. Regular use will ensure blemish free skin. Plantain is a tropical fruit that has been used since ancient times for its healing, lightening and anti-aging benefits. 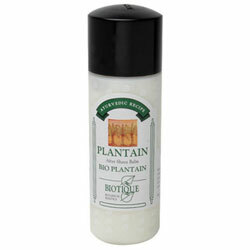 With high amounts of vitamin A, B6, B12 and C, plantain is one of the great regenerating resources in nature. Apply to damp skin, before moisturizing, A.M. and P.M. Massage lightly into skin, using upward/outward motions until absorbed.